This stout beer cake contains Chestnut Hill Brewing Company’s Shake It Out Stout and is topped with a chocolate glaze. Run, don't walk, because for a limited time, SOMO in Manayunk will offer boozy dessert. 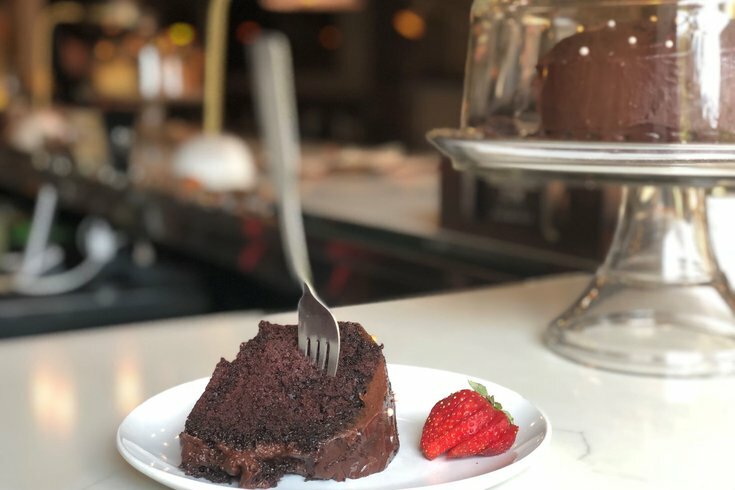 You'll be able to order alcohol-infused cakes from the restaurant through the end of 2018. This fall and winter, as the weather gets colder and bleaker, a bite of whiskey buttercream is sure to improve your mood. SOMO owner James Morrissey teamed up with local baker Claudia Stemler to create the indulgent sweet treats. • The White Russian – Combines Kahlúa and vodka in the batter and also has a Kahlúa buttercream. • The Margarita Cake – Made with three oranges, orange zest, tequila, buttermilk, fresh-squeezed lime buttercream and tequila buttercream. It's topped with sprinkles of salt and sugar. • Stemler’s Irish Cake – Features Bailey's Irish Cream and Guinness. It's topped with a whiskey buttercream. Stemler also plans to introduce cakes with Champagne and rosé later this fall. Slices of SOMO's boozy cakes are available daily for $10 a slice. Whole cakes can be ordered for pickup at the restaurant by calling (267) 297-6668. SOMO is located at 4311 Main St.